Many parents are concerned if their child is getting enough vitamins and minerals. This begs the question should my child be taking a multivitamin supplement? A recent report published by the Environmental Working Group (EWG) states that children are overexposed to vitamins and minerals due to consumption of fortified processed foods like cereals and bars as well as supplements. The EWG argues that there could be potential adverse effects from getting too much of nutrients such as vitamin A, niacin or zinc. Although such cases are rare a child is a greater risk if they consume fortified processed foods in addition to taking a daily multivitamin supplement. Furthermore, the current food labeling practice in the US can be misleading as the recommended daily nutrient values are based on adult intake levels even in foods marketed for children. The EWG advises that these labelling practices must be changed to reflect the recommended intake levels for children. Many nutrition experts contend that we should not be fortifying our foods with additional vitamins and minerals. There is no evidence of nutritional benefit to support the practice of fortification and it gives the consumer the false impression that these foods are healthy choices. In our opinion the best solution is to avoid feeding your child fortified processed foods on a regular basis. These foods are often high in sugar, additives, preservatives and salt. Instead the foundation of your family’s diet should be eating a wide variety of whole unprocessed food such as fruit, vegetables and whole grains. For healthy recipe ideas check out our website for tips and advice. Eating a well-balanced diet should provide sufficient levels of vitamins and minerals for your child. 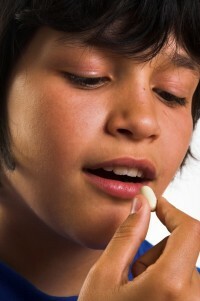 If your child has specific health concerns or dietary restrictions then a multivitamin supplement might be necessary. Before starting your child on a supplement be sure to consult with your integrative health provider or book a consult with one of our team members. Original article on “Why Kids Don’t Need To Take Their Vitamins” can be found at Huffpost Healthy Living.